Italian Bomba a Mano Mod. 35, S.R.C.M. The SRCM design was the most refined of the Mod.35 grenade series. The most significant feature is a fail-safe mechanism which would render the grenade inoperable in the event of a misfire, something the BREDA and OTO lacked. While at a glance it seems to be simple, the internal mechanism is complex, involving many small parts. It is a rather cumbersome item to assemble and was no doubt an expensive grenade to produce. We can see improvement to the safety bar mechanism with a loose and less binding fit. The brass tape used in the BREDA is replaced by a fine chain. The safety bar is further simplified into a thin flat strip. The method of use for the SRCM is similar to the other Mod.35 types... the pull tab/safety strip is removed, unlocking the safety lever. When thrown, the lever departs, unwinds the chain from the small stud withdrawing the safety bar which arms the grenade. 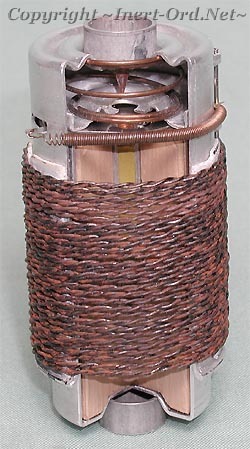 SRCM internals as configured prior to impact. The firing pin is fixed to the outer casing which is wrapped with a lead sleeve and a coiled fragmentation wire. 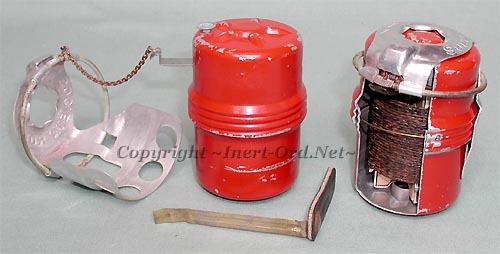 The explosive capsule, with the primer/detonator, is free to move inside. 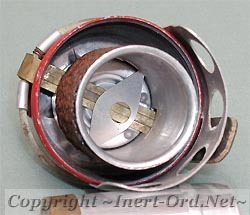 Once the safety bar has departed, the firing pin is held away from the HE capsule by a creep spring behind a pusher plate with a central hole. o Impact Bottom First - Momentum forces the outer casing (with the firing pin) downward into the primer. o Impact Top First - The HE capsule pushes up to the striker. o Impact from any side - The assembly is pushed sideways. Top and bottom sloped walls (on both the casing and the grenade body) compress the assembly forcing the firing pin and primer together. 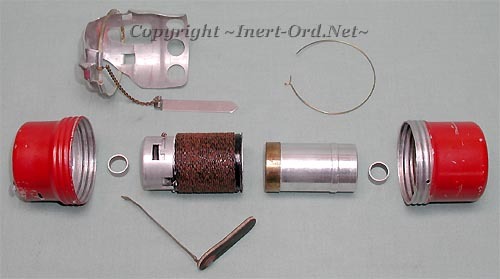 The fail-safe shutter mechanism only permits the primer and firing pin to merge when the grenade hits with sufficient force. There is a range of impact energy by which the grenade functions. Only a hard and sharp impact will detonated the grenade. If too little, the grenade remains armed. A moderate impact, about what might be achieved by dropping, and the shutter safety will cycle to the fail-safe position. There is no way to determine the state of the safety from the outside. Looking up at the shutter. It pivots at one end with the other end connected to a long coil spring, under tension. The shutter travels through a stepped slot configuration which gives it a three-stage action. At the last "fail safe" stage, the path leading to the firing pin is covered. At left is the shutter positioned at the fail-safe point.